Your unlimited access annual subscription ($349) will provide the most global, accurate, timely and comprehensive mare produce record information available, which can be easily and quickly viewed, emailed or printed. 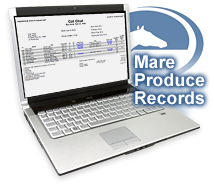 Purchase the Mare Produce Records Online (MPR) and receive a $25 equineline.com gift certificate ** for future equineline.com purchases (pedigrees, race records, portfolio service, etc.)! ** Your equineline.com account will be automatically set up with the $25 gift certificate once the MPR is purchased. If you've already purchased an equineline Mare Produce Records App (iPad or iPhone) subscription, and have associated it with an equineline.com account*, then your equineline.com account already has access to the equineline Mare Produce Records Online. No additional subscription is needed! Once you've purchased an online subscription, simply download the equineline Mare Produce Records App to your iPad or iPhone - restore the subscription* using your equineline.com account information used to purchase the subscription, and you'll have full access to the app with no additional purchase!